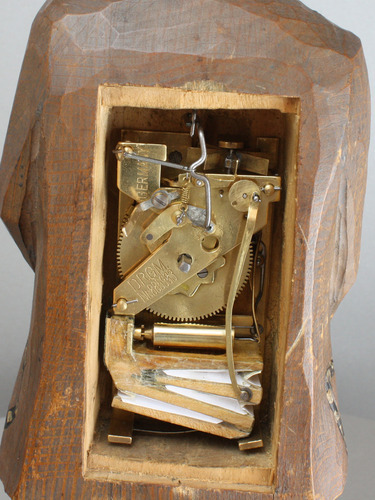 When wound anti-clockwise and the start/stop arc lever actuated, the figure comes to life by whistling "For He's a Jolly Good Fellow", while his head turns and then pauses to the left and then to the right, finishing looking straight ahead when he stops his recital. The movement is stamped D.R.G.M. No. 885983, with open top plate and the diametric spring loafer also stamped with the KG bird-on-peak mark. The head movement bar with sprung return. 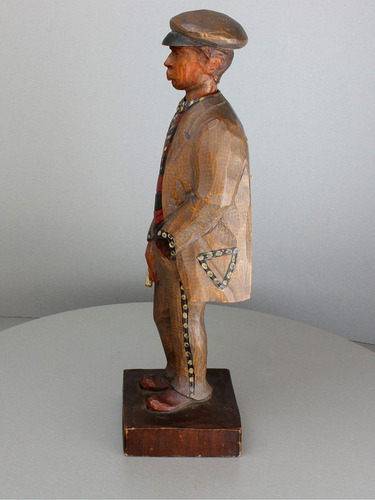 The movement is fitted within the hollowed back of the standing figure of a man. 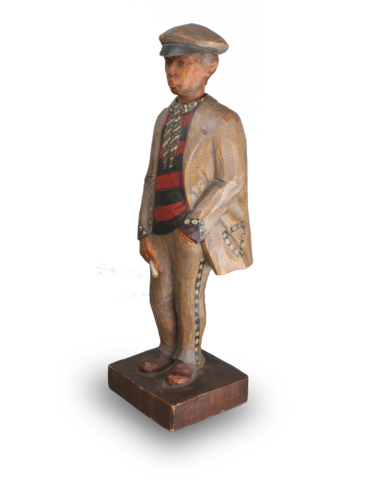 The carving of the figure is typically rustic and rather naive, and finished in light polychrome sheened tone in soft pastilles. 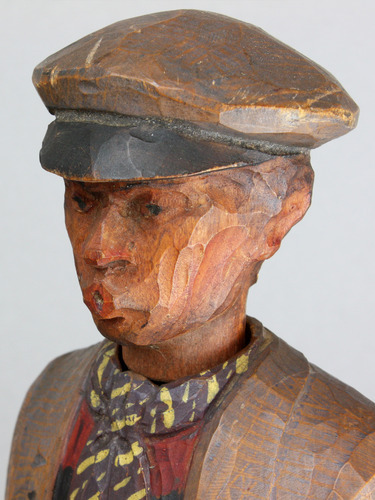 He wears a with cap and has his lips posed as if to whistle. 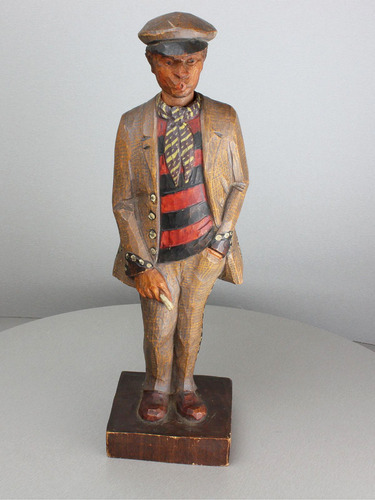 His left hand is in his trouser pocket while his right hand holds a cigarette. 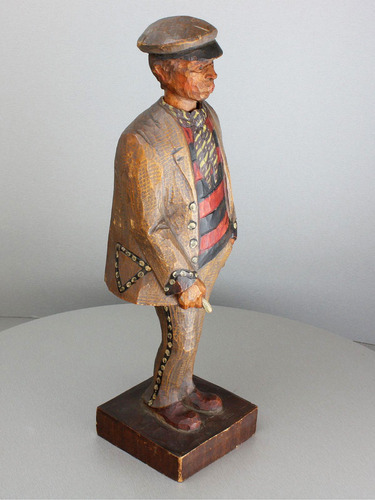 He wears a knotted scarf, striped shirt and three-quarter length jacket and stands on an integral square base. There is a craftsman's mark S incised to the rear left corner of the base and stamped to the underside in ink Germany. Karl Griesbaum's products were successful because they were highly commercial and understood market demand perfectly. 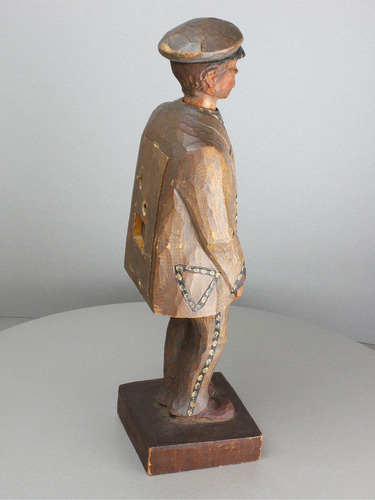 These Whistling Figures, or to give them their correct German title Pfeifende Holzfiguren, were carved from a single-piece of limewood, which was then carved with wide arced wood chisels to give that pleasant coarsely pitted surface finish before being painted. 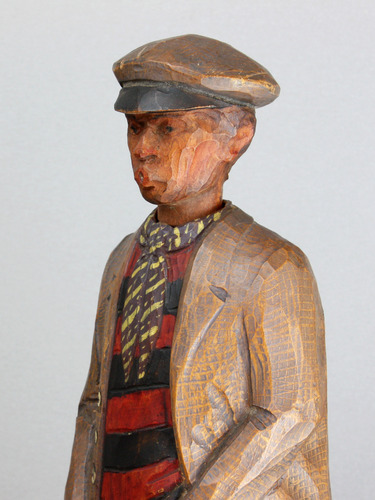 Variants of this figure include the Umberella Seller and the Drunkard Leaning against the Lampost. Of the twenty-plus different tunes fitted in these movements, the two most prized titles are 'O, du lieber Augustin' and 'For He's a Jolly Good Fellow'. The mark on the movement is interesting. D.R.G.M. stands for Deutsches Reichs Gebrauchs-Muster, a sort of blanket copyright scheme which protected the interests of the craftsman involved and was used from 1936 until they stopped all work in 1940. In 1945, the R for Reichs was replaced by B for Bundes, making these first-run figures very easy to date within just four years. One winds this anti-clockwise, as the movement is a top-wind arrangement. The friction-tight access panel to his back also has a small mesh-covered panel allowing the sound to escape. See Mechanical Singing-bird Tabatiéres, by G. T. Mayson, pp.167-169. The remarkable condition, colour retention and movement of this untouched piece is remarkable. Enjoy another highly notable work by the favourite German workshop.